Lagoon 42 is a 2017 catamaran just entered in our fleet. Lagoon 42 sailing catamaran for rent is available of charter in Greece from Athens and Lavrion. 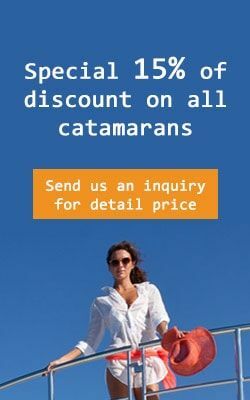 All the catamarans are also available for charter one way to Santorini and also from Santorini to Lavrion or Athens. The Lagoon 42 has all good designs that Beneteau integrated in the lagoon and much more. It has a brand new design with modern lines that Lagoon 42 catamaran makes one of the most beautiful catamarans on the market with more comfort than the older models like Lagoon 440 or the Lagoon 500. You can Charter yacht Lagoon 42 for hire in Greece boasts that has 4+2 cabins so can accommodate 10 people + 2 crew members in the separate cabins in front bow cabins. The front cabins are of the professional skippers that we have in our service and also if you need a hostess or chef to prepare you the meals, food and beverages on you vacation to give you the time of you life while cruising the Greece coast on the Lagoon 42 catamaran. The sailing catamaran Lagoon 42 is also available for bareboat charter, the Lagoon 42 catamaran can accommodation for up to 10 guests in total in 4 cabins + the saloon. With this luxury and comfort that the Lagoon 42 catamaran offers you on your holiday in Greece you can also add the extras like Air condition and generator that is a standard equipment on all our Lagoon 42 catamarans for charter in Greece. Visit all the islands that you heard abut like Mykonos, Pars, Satorini, Mios, adn much more. The mast moved further toward the back and the self-tacking jib, an assurance of execution under sail and simplicity of taking care of, give the capacity to unite all operations in one place. A valuable addition for sailing in Greece. a conclusion board for helming station security when under way. a substantial coated entryway that involves the whole width of the coachroof, and gives access to the unparalleled interior volumes. The suspended strides at the transom give a radical new view of the pontoon: a persistent, wide and welcoming stage, deserving of a substantial vessel. The impact of the natural engineering resounds in the inside volumes. Alluring shaped wood accentuates the smooth bends of the inside furniture, outlined with care by Nauta. 3 or 4 twofold lodges … and what lodges! the U-molded cookroom, completely fitted with expansive work surfaces and broad storage room, is situated towards the outer cockpit. With all these advantages and innovations, Lagoon 42 is easy choice for catamaran charter Greece.